Sandalwood is a type of fragrant wood which gives us one of the most prized essential oils in the world: the sandalwood oil. Soaps are another popular product using sandalwood – there are soaps whose main active ingredient is sandalwood oil, while there are other soaps that contain sandalwood oil and a variety of other essential oils. Sandalwood French soaps are particularly valued by beauty and wellness buffs. If you haven’t used a sandalwood soap in your personal care regime but are willing to try one, we’re telling you in advance that they do not come cheap – prices usually range from $7 to $10 per bar. But for fans of the sandalwood French soap, they love its irresistibly woodsy aroma and dense, luxurious lather. Most of all, they believe that the sandalwood soap has been proven in giving their skin a smooth and velvety feel. They think that the great and positive results from using sandalwood soaps are truly worth their high price tag. And when you know that a sandalwood soap is particularly made in the French provinces, you know that it’s made of premium ingredients – in other words, they’re the crème de la crème in the beauty bar area. The purpose of all this repeated milling is to squeeze out the excess moisture and air from the soap base until it becomes a paste and ready for molding. This leaves a solid soap that is neither watery nor dry while giving an excellent lather. Unlike other soaps that liquefy easily and tend to shrink over time, a triple milled soap is definitely longer-lasting, which means longer and more repeated uses. 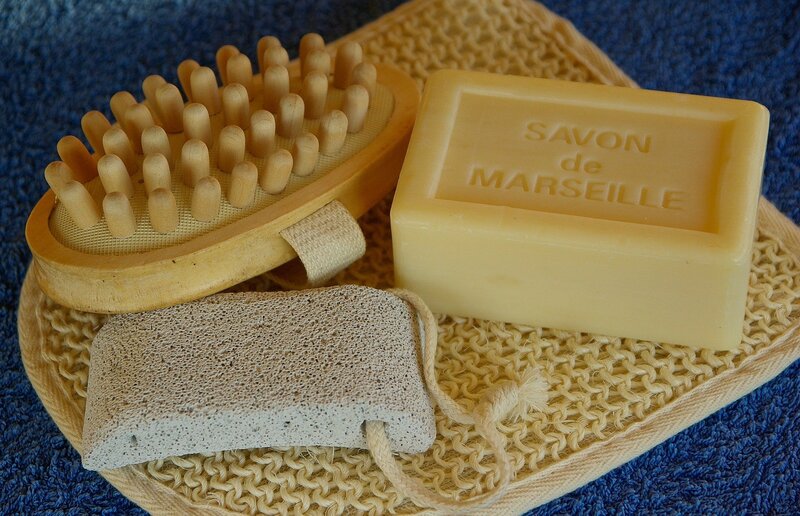 A triple milled soap is also called a “French milled soap” – the French have been employing this traditional soap-making technique for many centuries, and it hasn’t changed up to this day. This soap is manufactured by L.E.H. Soap Company, which has been making handmade soaps since the mid-1990s. These totally cruelty-free soaps are made from the purest and the finest ingredients including sandalwood. This 7-ounce (200 g) bar soap is also enriched with shea butter. Like other artisanal soaps, the Cedar Sandalwood Soap is a “triple milled soap.” It moisturizes your skin and has the subtle scent of sandalwood that lasts for a long time, even as you use it over and over again. You can order this soap on Amazon or on L.E.H.’s website: https://lehsoap.com/. This soap undergoes a quad-milling process, which means that it has reached the consistency of a quality beauty soap that is fragrant and produces a rich lather for that luxurious feel. No animal testing is involved in the making of this soap. It uses only pure, all-natural ingredients that are proven safe for even the most delicate skin. This hand-crafted soap uses shea butter that moisturizes your skin, and it gives off a subtle sandalwood aroma that energizes yet also calms your senses as you bathe. You can order this soap on their website (https://predeprovence.com/) or on Amazon. When you think of beauty soaps, you’d think that they’re specifically made for women because they have more delicate and sensitive skins. But of course, men deserve some care too. After a hard day’s work or an intense sports activity, men need refreshing, indulgent and aromatic bubble baths (or hot showers) that will help them relax and get them revved up at the same time. That’s why Mistral introduces this soap that is specially formulated for a man’s skin. Mistral’s Men Soap is made with a combination of spicy and subtle fragrances that will surely captivate a man’s heart. These aromatic components include cypress, thyme, clove and sandalwood oil, among others. Despite the multitude of fragrances, this soap has been tested and proven not to cause skin irritations. It also includes grapeseed oil that softens and smoothens a man’s skin. Mistral’s Men’s soap is a triple milled soap which guarantees a longer-lasting use. You can order this soap on Mistral’s website (https://www.mistralsoap.com/) or on Amazon. This sandalwood soap from La Savonnerie is made from organic and all-natural ingredients – no animal matter is included in this soap, which is also cruelty-free. It is hand-crafted by seasoned French soapmakers so that you will enjoy its delicate sandalwood fragrance and rich lather that give off a totally exquisite feel. These sandalwood French soaps are all organic and use the finest and the most natural ingredients. The delicate fragrance, plus the relaxing and energizing properties of the sandalwood essential oil, will keep one refreshed and invigorated. The shea butter helps in moisturizing your skin, leaving it smooth and supple. If you’re a vegan, you can buy any of the sandalwood French soaps listed above as they use no animal ingredients, and no animal testing is involved in the making of these soaps. Buy a sandalwood French soap now and feel absolutely pampered in your every bath!